I have spent the day working at the Herbert Art Gallery which has an excellent exhibition at the moment of the work of Michala Gyetvai. Michala is a local artist who works in thread, fabric and paint to represent nature trees and landscape and it is very good. Using this medium she had produced haunting, powerful images of trees. I must admit, being a man, it took me a bit to understand what seemed at first to be sewing but when it hit me it was like being hit with a slice of lemon wrapped around a gold brick. I have had a few days off over winter and it has taken me a bit to find a topic to write a post about and it occurred to me, in conversation with Rob, in fact it was Robs idea that we do not think about the forests of ancient Britain enough. In fact it is rather difficult if not impossible for us to really get to grips with how dominated these islands were by these oak forests. The farmlands of Britain, the patchwork quilt of fields seen from a plane, are an incredibly recent phenomena. An unforested Britain, familiar to us, and people all over the world, from Victorian pictures is unusual. Throughout our history we have been dominated by the deep dark woods. The deep dark woods were not the exception, they were the rule. It was an isolated farmstead, a Celtic hill fort or emerging Roman city that was the exception, surrounded at all times by a sea of green foliage and if that foliage were gifted the power of the movement it could easily have shaken man from the island, into sea and reserved the island for themselves. 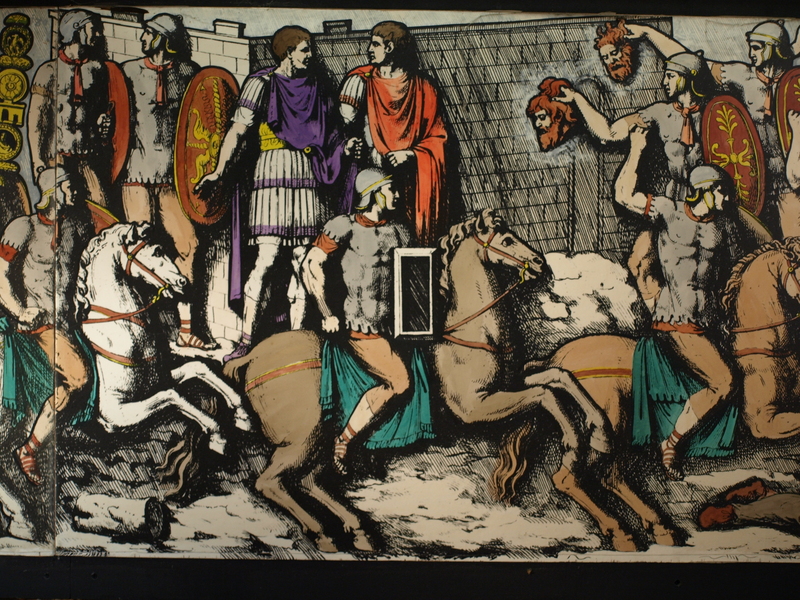 For the Romans this must have been… disconcerting. In the early years the famous Roman roads had not been completed and even where they had a cohort might march out of Colchester and vanish almost immediately into the forest. Forests were not the friends of the Romans and since the terrible loss of three legions in the Teutoburg forests generals into the darkness. Varians humiliation cast a deep shadow over the minds of later generals who would prefer to use auxiliaries in the Britain rather than their heavy infantry. The invincible heavy infantry were disadvantaged in the woodland in contrast to the auxilaries who, recruited from Germany and Gaul were in their element. To march out of the fort was to march into hostile territory where the Romans were usually at a disadvantage. The forests inhibited communication, speed of movement and combat efficiency. And after the Boadicea revolt with those forests haunted by dispossessed Celts it is no wonder that the “pacification” of the midlands took over a decade. 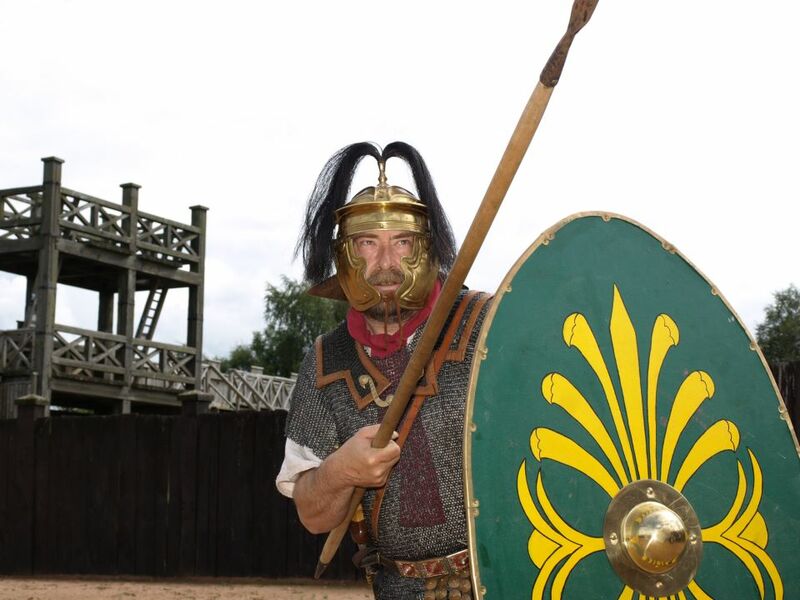 My last post about spending the night before the last battle between Boadicas forces and the Romans has attracted a lot of positive attention and I have considered another moment in history I would have liked to witness. In 60AD Paulinus was the Governor of Britain and it was going really well for him. The Celts were subjugated, their chiefs falling under Romes spell and influence and he was on the verge of eliminating the Druids. The Druids were a very important pillar of Celtic resistance, they kept the culture alive, held influence and engaged the Celtic soul, they needed to go if Roman authority was to thrive. Paulinus took his forces to Anglesy leaving only a token force to protect the rest of Britain he went to secure Britain from the metaphysical threat posed by Druids. He was successful, we don’t have Druids anymore. Genecide, frowned upon in the modern world, was in the ancient world the kind of thing you give medals for. He was probably feeling quite good about his prospects as he wandered through the burning, body filled groves until the messenger found him. The messenger had, bad news. The Celts had risen up in revolt and were very very angry. This was not just a little local upset this was potentially the end of Roman Britain and with that the loss the grain supply that enabled the Romans to hold the Rhine, the raw materials to build the weapons and armour for the Dacian war and the slaves that would enable the Romans to live a life of ease. He quickly returned to the Colchester to put down the revolt only to discover that the vetrans colony was not there anymore, the temple was burnt down with the citizens inside and the population was mascaraed. Masacrared populations were not unwelcome to the Romans, but when it was their population that was a different matter. Paulinus was furious. Burning the Temple was an insult to the Imperial Cult, killing of veterans was an insult to the army and his inability to protect both civilians and veterans was a clear invitation for other peoples to revolt. He moved on to London and had a shock. It was at London that the scope of the problem became clear. 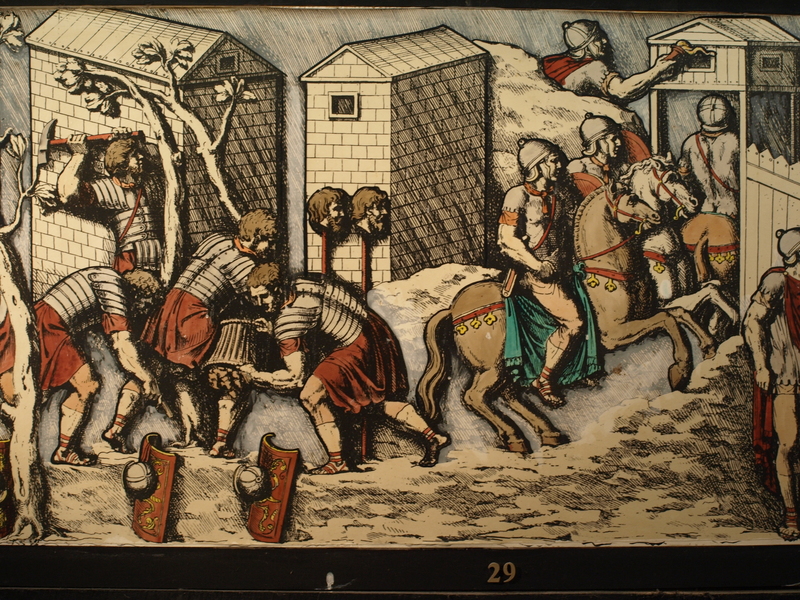 The enemy numbered in excess of 120, 000 and were moving to eliminate the Roman state. They killed tax collectors, administrators and, on the negative side, citizens, veterans and British collaborators. His position was not good. He had about fifteen thousand soldiers with him. So he called for reinforcements. One legion was ambushed and totally destroyed, to the last man. Taticus describes this as a period where the Romans were were fighting not for victory but for their lives. Force marched into the fens and just vanished into the mist and the legion at Exceter did not move out of the city. For the Governor this was not a good day at the office. Not only was his province falling apart he would have to explain himself to the Emperor and Nero was not the most forgiving of managers. Evacuation was the only option. He told the citizens that he was leaving and urged them to follow. About half of them did and the other half stayed and died when the Celts descended on the city. After a few days he was joined by more Roman forces swelling his force by about ten thousand and about this time Jupiter smile on him. He found a battlefield, now lost in the mist of time, that he could work with and waited for the Celts who were hot on his trail fresh from destroying St Albans. Night fell and the battle was set for the morning. The Romans prepared and listened as the Celts drank, sang and laughed long into the night. Did Paulinus sleep that night? Could he have? Imagine the stake, the province of Britain could be lost if his twenty five thousand could not stand against the Celtic one hundred and twenty thousand. Was he right to try? to risk his hand or should he evacuate the Romans and commit himself to suicide? The next day his pitiful force faced the Celts. Now, with the benefit of hindsight it seems obvious that with all their advantages the Romans would win. Heavy infantry against light infantry usually ends one way. But on that day it seemed that the Romans would be swept into the sea but as the sun set Paulinus was still standing. Eighty thousand Celts lay dead, among them Boadicea at a cost of four hundred Roman fatalities and the Governors world had turned from disaster to gold. Paulinus had, through discipline, self belief and skill snatched victory from the belly of defeat. At the Lunt I often run tours for the public based on the tours that I run for children but pitched at a more adult level. Now by this I do not mean we have young ladies of negotiable affection running about I mean I can talk about the more, aggressive tenancies of Roman peacekeeping efforts. The fort was constructed just after the Boadicea revolt and is seen as a horse training facility. This is the family friendly interpretation… there are others. 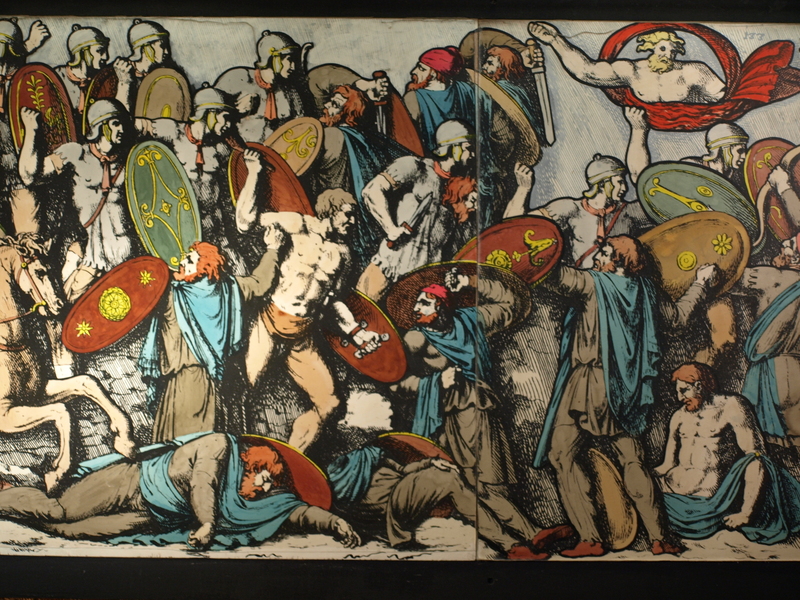 The Romans inflicted terrible vengeance on the Celts after the revolt. They put an end to the Celtic way of life forever, killing both people, religion and culture. They did this terrible thing because they knew what the most destructive force was in the first century. The most destructive force in their world was revolt. The Romans needed the resources of Britain, the iron, gold, tin, copper, grain and slaves because Rome was a monster that had to be fed. Without provinces to feed that monster the whole imperial system fell apart. The British Empire may have been influenced by the Roman but on the skin is where the similarities end. Rome was a city state with provinces which fed the plebs so they would not revolt. The British were an expansionist, trade and cultural empire that wanted to change the world. A revolt in India was a was an irritation, a revolt in a Roman province such as Judea or Britain was a catastrophic disaster with imperial implications.